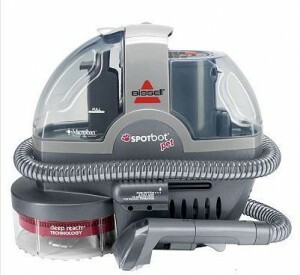 If you have pets or kids, the Bissell Spot Bot Pet Portable Carpet Cleaner is a life-saver! This is great for pet messes and spills, just about anything you can throw at it. Right now, Kohl’s has a really good deal on one. You can set it on a spill and set it to clean the stain and walk away, or you can use the hose and manually clean those harder to reach spills in tight spaces. If you purchase this online, you can use CUPID30 (until 2/20) and take 30% off your order. Kohl’s offers free shipping on all orders over $75. The Bissell Spot Bot normally retails at Kohl’s for $199.99. Kohl’s Cash earned from now until 2/18 can be redeemed between 2/19 and 3/5. The deal gets even better when you mail in the $20 Mail-In Rebate from Bissell. Be sure to go through Ebates and get 6% of your pre-tax purchase back.